This theory allows for no gap or a large gap of time within the first two verses of Genesis, but that is where its similarities with the Gap Theory, created in the 17th century and made popular in the early 20th century, end. The Windows of Heaven theory also contains within it a modified Canopy Theory. 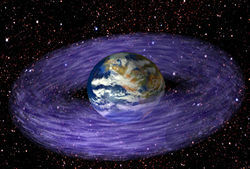 Instead of an entire water canopy around the Earth, the author envisioned a water vapor torus in which the stars could be seen through two "windows" above and below the torus from Earth. Brackets are placed around the words "and" placed at the beginning of sentences because they don't exist in the Hebrew text. Thus there are no conjunctions linking these statements. In fact, there is not one single Hebrew "and" in the entire first chapter of Genesis. The conjunctions were added in the English versions for ease of reading. This being true, the "beginning" is no longer grammatically linked to "the first day" of Genesis 1:5 (KJV). This theory accommodates those desiring an ancient universe sufficient for ancient starlight. God created the universe "in the beginning," but none of the details of star and galaxy creation are given in Genesis 1. Not until verse 16 are the stars even mentioned. But the English words before and after "stars" are not in the Hebrew text. The Windows of Heaven theory presupposes that the stars were created "in the beginning," not on the fourth day; and only mentioned in verse 16 because they are also lights in the heaven. In the Windows of Heaven theory, the stars do not become visible to an earthly observer until day four. The phrase "evening and morning" implies that the point of view of the creation account is from a person on the surface of the Earth. This is because from outer space, there is no evening or morning. From space, evening and morning are changing locations on the Earth below. According to the Tablet Theory, God wrote His account of creation (Genesis 1:1-2:4) for Adam and Eve as if viewed from their perspective on Earth. So to Adam and Eve the universe consisted of the visible "heaven" and the physical "earth" they walked upon. The Earth existed "in the beginning," and was basically a water planet rotating in the darkness. Since it was a water planet, it "was without form" and it was "void" of life. The solar nebula of our proto Sun exhibited certain characteristics of an astronomical accretion disc. But in our solar nebula, the Earth was already a planet before our proto Sun ignited. Others have noted problems with the current nebula theory. The first day of the transformation of our solar nebula towards a solar system is described below by the author of the Windows of Heaven theory with his permission. Again, from the author . . . The rings of Saturn are composed of ice and dust.. If the Earth was further away from the Sun's heat, this water vapor torus might have become a flattened ice/dust disc like Saturn's. The author notes the solar wind was continuing to push debris clouds away from the inner planets. From the "evening and morning" pattern of the days of creation, the Hebrews begin their days at dusk. 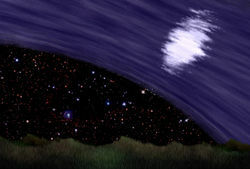 At dusk on the fourth Hebrew "day" the solar wind had cleared the debris passed Earth so that as night fell, the light of the moon could be seen through the vapor torus. Note that Genesis does not mention the sun until Genesis 15:12 (KJV) after Noah's flood. Viewing the "lesser light" (moon) from Earth through a water toroid. From the author . . .
On the fifth day God creates fish and fowl, and the fowl fly above the earth in the "open firmament of heaven" which is the atmosphere. It took forty days for the water vapor torus around the Earth to completely rain out. The "windows of heaven" opened wider and wider until the water vapor torus vanished or "stopped". That concludes the "windows of heaven" creation theory. This page was last modified on 11 August 2014, at 19:06.